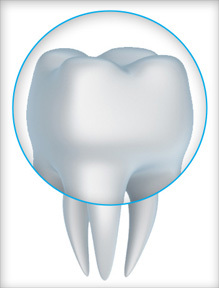 A tooth crown is an artificial cap for teeth that replaces the visible portion of your tooth. A tooth crown can be placed on your natural tooth roots, on a dental implant or be held in place with a partial denture. The dental crowns Dr. Blaisdell places are functional and beautiful. Most people will never even notice that your tooth crown is not your natural tooth but a cap for teeth. Consultation: Dr. Blaisdell will meet with you in Boise to determine if a tooth crown is indeed what you need and if so, which dental crowns are best for you. Preparation: A cap for teeth can be placed on your tooth roots or a dental implant. If your natural roots will be used, the visible portion of the tooth will be reshaped to fit your new tooth crown. If your dental crowns are to be placed on implants, the cap for teeth is simply attached to an abutment on the implant. Placement: Once the surface of your natural tooth or dental implant have been prepared, the cap for teeth is permanently attached. BEAUTIFUL | Dr. Blaisdell places truly amazing looking dental crowns at our office near Eagle ID. Your friends and family may literally never even notice your tooth crown is not your natural tooth. DURABLE | A quality cap for teeth is not fragile — it may even last as long as you. FUNCTIONAL | A cap for teeth does exactly what it is intended to do. Namely, function as a tooth. You can laugh, eat and smile with confidence for many years to come with top-notch cap for teeth or dental crowns. A visit to our dental office in Boise will help determine whether a dental crown is right for you. If you have questions about tooth crowns or you’d like to schedule, please call, text, or fill out the contact form on this page! We look forward to meeting you!